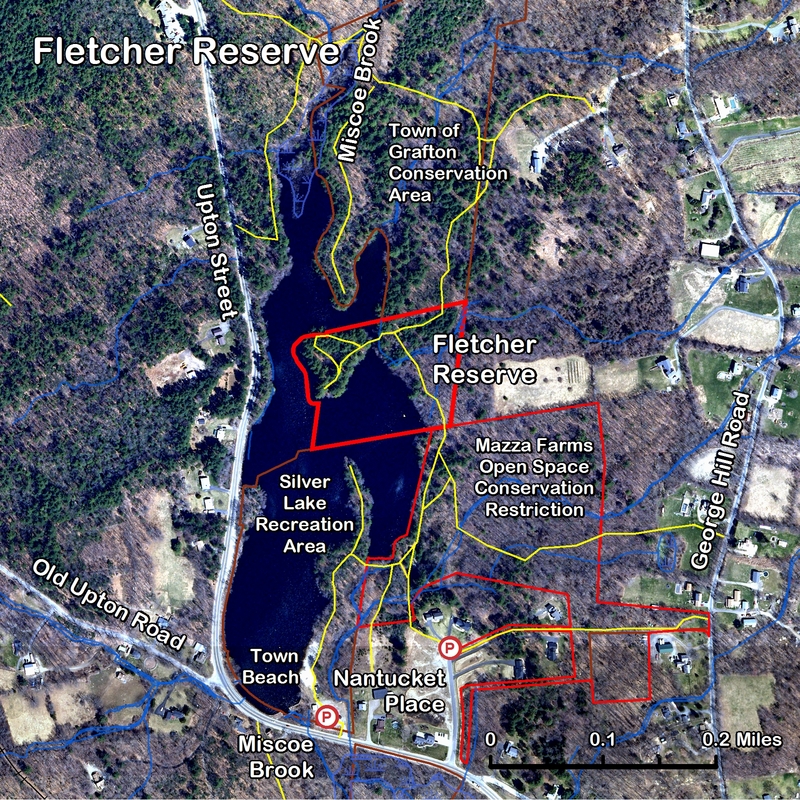 The Fletcher Reserve consists of about 3.7 acres of land on the eastern shore of Silver Lake and a 1.75 acre island. The island is separated from the eastern shore by a shallow "stream" that can be passed over on foot. A multi-use trail crosses the parcel from the north and south, and accesses the island to the west. The land on the eastern shore of Silver Lake is midway between the 21 acre Grafton Conservation land called the Mazza Farms Open Space on the southeastern shore and the 25 acre Grafton Conservation land, unnamed, on the northeastern shore. It consists of upland mixed deciduous forest. An intermittent stream called George Brook, in the deed, enters the parcel from the east and splits into two tributaries, both emptying into Silver Lake. The island rises 15 to 20 feet above the lake and consists entirely of a mature pine forest. The forest floor is wide open and is covered in most places by a deep layer of pine needles. It is accessible by water and has a natural landing for canoes, kayaks, or other small boats on its southwestern shore. Fletcher Island is the only Grafton Land Trust property that features swimming. There is a rope swing on the southwestern corner that is enjoyed by kids, young and old. The island also has a natural rock fireplace and has been used as an unauthorized camping area for many years. For several years through the late 1960s the then Grafton Forest Association sought to purchase the island on Silver Lake from Judge Gordon A. Shaw of Milford, MA. The Trust's initial offer for the island was $3,500. Ater several years of intermittent negotiations, the purchase of the island and some of the eastern shore of the lake was closed in March of 1970 for $5,000. The money came from member contributions and fundraising, including $1,000 from Wyman-Gordon. At the time, the island was not accessable from the eastern shore. That summer, 75 people went to the island by boats for a picnic and a dedication ceremony. 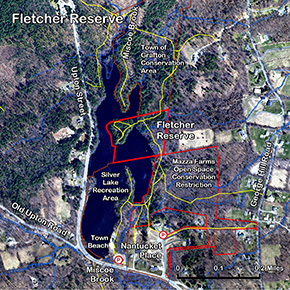 The property was dedicated to the memory of Helen Fletcher, a former naturalist and a GFA member and was named the Fletcher Reserve. Owned by Charles W. Lingley from April 1882 until June 1914 . Owned by Mary E. Davison from June 1914 until Selma E. Oberg took ownership and sold the property in December 1947. Owned as a part of a 60 acre parcel by Willard H. and Anges A. Whipple of Grafton, MA from December 1947 until April 1965. Owned by Judge Gordon A. Shaw of Milford, MA from April 1965 untill March 1970. There was a fire on the island in June 2008. It probably started from an abandoned fire in the camp area. The fire burned the underbrush on the southeastern part of the island. The fire was reported by abuttors from the Upton Street sider of the lake. The Grafton Fire Department responded. They accessed the island by boat and extinguished the fire with portable equipment.